Getting on in the years the toenails (especially the little and big toe’s nail) tend to be a bit thicker and I wanted something along the lines of heavy duty clippers to keep them trim. Lets face it – those pathetic little scissors you use for those silly long eyebrows just don’t cut it anymore! 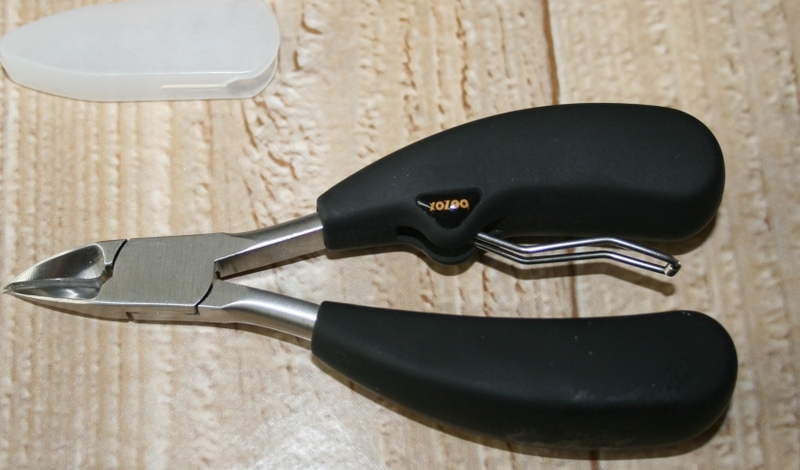 If like me you ended up totally fed up with bending double and straining your fingers through baby scissors – then read on – because I think I have found just the thing you need. You see I have come to realize that cutting ones toe nails with tools not made for the job is actually quite dangerous because with straining and forcing there is an increased chance that your hand may slip and the blades end up digging into your foot or toe. 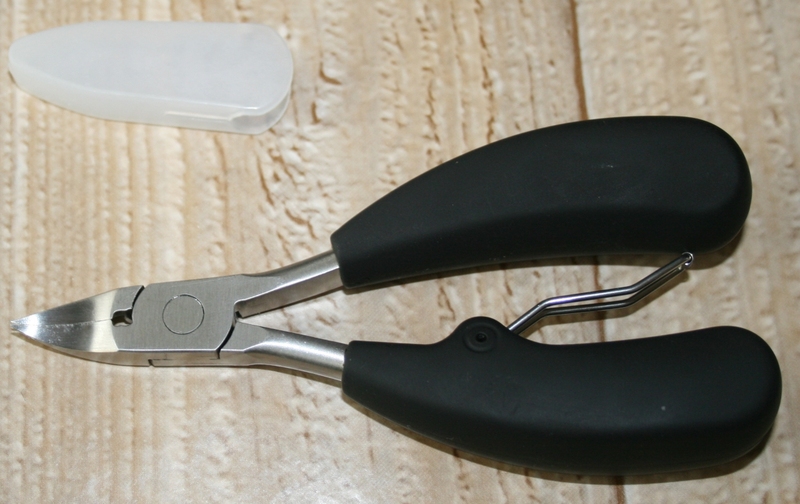 The ones I have in mind are more like the wire cutters you have in your toolbox, and are not the traditional spring clippers you typically find in Christmas crackers (although I do also review a superior set of these aswell – because good quality clippers which are sharp and sturdily constructed will do a great job on thinner nails). So lets take a look at what I have found. These slice through dry or wet nails no problem. First of all we can see they have thick rubber handles – so no more squeezing your fingers through tiny little clipper holes – get a grip on these and you have immediately high levels of torque via the long handles and super firm grip with which you can apply the required pressure – which believe me – no matter how hard your nails are (or thick) you don’t need much pressure because the blades are ultra sharp. Notice that the image above shows the back of the cutting edge, you actually place your nail as if you could see it in the picture poking through into that recess – then “chop” and its gone. The blades are curved and whilst I prefer to make my own curve I suppose this is handy. 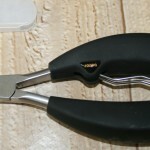 Notice that there is a wire spring between the handles – this folds up towards the opposite handle and stays there whilst cutting, thus once you release the pressure on the grips, the clippers automatically open back up again ready for the next nail – you don’t have to move your hand around them to open them like you do with a pair of work pliers for example. For storage, there is a blade cover as can be seen – and the point is so sharp it’s well worth keeping this in place. These nail clippers are extremely sharp. 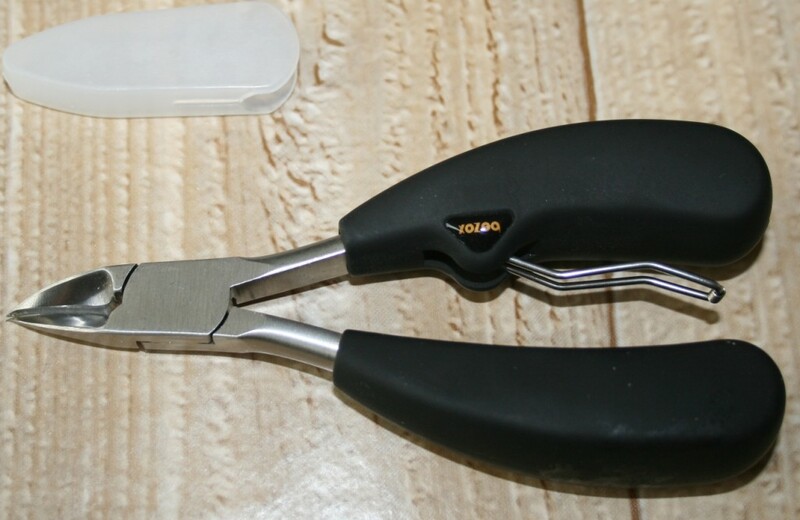 In the above photograph I have flipped the cutters over to show the curve of the blade, you will have no problem and zero struggling cutting your toe nails with these. I would even suggest that using such a high quality clipper like this could help prevent ingrowing toenails – why is this? Well if you cannot cut your nails properly with whatever you currently use, then you may end up mis-shaping them and not bothering doing the job properly because it’s just too much of a struggle. With these, the odds are that with no struggling and slippage risk, time can be spent shaping and trimming to the perfect size, with opportunities to re-trim or cut in stages which were previously not available. Lets put it this way – a 10 minute fight after a bath has now gone to a 1 minute simple task which I can perform on a more frequent basis as well, because I always dreaded having to cut my nails! So name them as you will – nail trimmers, nail cutters, scissors or clippers – at the end of the day the world needs to know that small ineffective blunt cutters are a thing of the past!